(Nanowerk News) Researchers at Virginia Commonwealth University and universities in China and Japan have discovered a new structural variant of carbon called "penta-graphene" - a very thin sheet of pure carbon that has a unique structure inspired by a pentagonal pattern of tiles found paving the streets of Cairo. The newly discovered material, called penta-graphene, is a single layer of carbon pentagons that resembles the Cairo tiling, and that appears to be dynamically, thermally and mechanically stable. "The three last important forms of carbon that have been discovered were fullerene, the nanotube and graphene. Each one of them has unique structure. Penta-graphene will belong in that category," said the paper's senior author, Puru Jena, Ph.D., distinguished professor in the Department of Physics in VCU's College of Humanities and Sciences. The researchers' paper, "Penta-graphene: A new carbon allotrope", will appear in the journal Proceedings of the National Academy of Sciences, and is based on research that was launched at Peking University and VCU. Qian Wang, Ph.D., a professor at Peking University and an adjunct professor at VCU, was dining in a restaurant in Beijing with her husband when she noticed artwork on the wall depicting pentagon tiles from the streets of Cairo. "I told my husband, "Come, see! This is a pattern composed only of pentagons,'" she said. "I took a picture and sent it to one of my students, and said, 'I think we can make this. It might be stable. But you must check it carefully.' He did, and it turned out that this structure is so beautiful yet also very simple." Most forms of carbon are made of hexagonal building blocks, sometimes interspersed with pentagons. 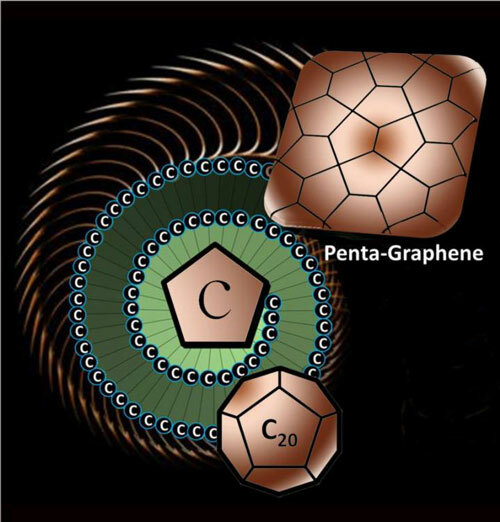 Penta-graphene would be a unique two-dimensional carbon allotrope composed exclusively of pentagons. Along with Jena and Wang, the paper's authors include Shunhong Zhang, Ph.D candidate, from Peking University; Jian Zhou, Ph.D., a postdoctoral researcher at VCU; Xiaoshuang Chen, Ph.D., from the Chinese Academy of Science in Shanghai; and Yoshiyuki Kawazoe, Ph.D., from Tohoku University in Sendai, Japan. The researchers simulated the synthesis of penta-graphene using computer modelling. The results suggest that the material might outperform graphene in certain applications, as it would be mechanically stable, possess very high strength, and be capable of withstanding temperatures of up to 1,000 degrees Kelvin. "You know the saying, diamonds are forever? That's because it takes a lot of energy to convert diamond back into graphite," Jena said. "This will be similar." Penta-graphene has several interesting and unusual properties, Jena said. For example, penta-graphene is a semiconductor, whereas graphene is a conductor of electricity. "When you take graphene and roll it up, you make what is called a carbon nanotube which can be metallic or semiconducting," Jena said. "Penta-graphene, when you roll it up, will also make a nanotube, but it is always semiconducting." The way the material stretches is also highly unusual, the researchers said. "If you stretch graphene, it will expand along the direction it is stretched, but contract along the perpendicular direction." Wang said. "However, if you stretch penta-graphene, it will expand in both directions." The material's mechanical strength, derived from a rare property known as Negative Poisson's Ratio, may hold especially interesting applications for technology, the researchers said. Penta-graphene's properties suggest that it may have applications in electronics, biomedicine, nanotechnology and more. The next step, Jena said, is for scientists to synthesize penta-graphene. "Once you make it, it [will be] very stable. So the question becomes, how do you make it? In this paper, we have some ideas. Right now, the project is theoretical. It's based on computer modelling, but we believe in this prediction quite strongly. And once you make it, it will open up an entirely new branch of carbon science. Two-dimensional carbon made completely of pentagons has never been known."